Perhaps no idea is more widely accepted among urban core theorists than the notion that higher population densities lead to more productivity and sustainable economic growth. Yet upon examination, there are less than compelling moorings for the beliefs of what Pittsburgh blogger Jim Russell calls “the density cult,” whose adherents include many planners and urban land speculators. Let’s start at the top of the urban food chain, the world’s 28 megacities of over 10 million people (which we are defining as areas of continuous urban development, incorporating suburbs and satellite communities). Is greater density the key to great prosperity? For the most part, the world’s densest megacities are the poorest. Take the densest, the Bangladeshi capital of Dhaka. Its 14 million residents are squeezed into an area of 125 square miles, making for a population density of 115,000 per square mile, as reported in the latest edition of Demographia World Urban Areas (which includes estimates for all known urban areas in the world with at least 500,000 residents). 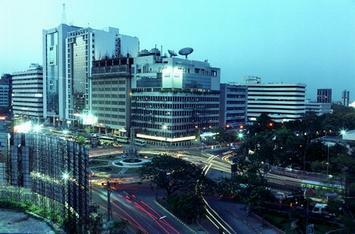 Dhaka’s per capita gross domestic product, $3,100, is the lowest of all the world’s megacities. Three other megacities — Mumbai, Karachi, Delhi — have population densities that are between three to seven times as high as the biggest megacity, Tokyo-Yokohama, which has a density of 11,000 per square mile. Tokyo is also much richer; the region’s per capita GDP tops $41,100, while the three ultra-crowded metropolises on the subcontinent have GDPs under $10,000 per capita. In contrast the two most spread out megacities, Los Angeles and New York, have population densities about half or less of Tokyo’s, but their per capita GDPs rank number rank first and third ($63,100 in New York and $54,400 in Los Angeles). Do any dense metropolitan areas boast higher GDPs? Seoul-Incheon, South Korea, packs more than 20 million people into an area roughly a quarter of Tokyo’s and at a density four times that of Los Angeles. Its per capita GDP, at $32,200, is the highest among the 10 most dense megacities. Paris, which is twice as dense as New York and 50% more dense than Los Angeles, stands at $53,900. (Yes, Los Angeles is denser than New York — despite its small central core, L.A. lacks the wide stretches of bucolic suburbia common in eastern cities). This imperfect, if not inverse, relationship between density and wealth is widely ignored by most urban core boosters, many of whom argue that packing people together is the true key to economic growth. But more often than not, notes Russell, the objective is aggrandizing the “creative class” — those who tend to settle in dense urban cores and also work in industries that do best there, but with little positive for everyone else. Many retro-urban theorists maintain that high density is the key to urban prosperity. These theorists often point for justification to Santa Fe Institute research that, they claim, links productivity with density. Yet in reality it does nothing of the kind. Instead the study emphasizes that population size, not compactness, is the decisive factor. Size does matter. A region is helped by the infrastructure that generally comes only with a large population, for example airports. But being big does not mean being dense. In fact the U.S. cities that made the largest gains in GDP in 2011 — Houston, Dallas-Fort Worth and greater Detroit — are not dense cities at all. Some of the metropolitan regions that have the highest per capita GDPs in the world based on purchasing power are not particularly dense. The two regions at the top — Hartford, Conn. and San Jose, Calif., — are if anything largely suburban in character. Neither has a strong central core, and most of the jobs in the areas are on the periphery. These areas are marked by everything that density advocates detest: They have very low levels of transit ridership and are largely dominated by single-family homes. The most affluent, Hartford, has among the lowest urban population densities in the world. It turns out that our low-density, “sprawling” metropolitan areas do very well in terms of wealth creation. Of the top 10 urban regions in the world in terms of GDP per capita all but one — Abu Dhabi in the United Arab Emirates — are located inside the United States. There are many thriving American urban areas with densities below the U.S. average for large urban areas.This includes not only Hartford, but also Boston, Durham, Seattle and Houston. Indeed, smaller, low-density Des Moines nearly broke into the top 10 (13th), reflective of the economic gains being made in the Great Plains. We may think, for example, of Boston, which ranks fifth in the world in per capita GDP, as a tightly packed urban area. But once one gets behind the relatively small urban core, the overall density is barely 2,200 per square mile, less than half San Jose or Los Angeles, hardly a fifth that of Tokyo and not much more than Atlanta, the least dense major city in the world with more than 2.5 million residents. Why is this the case? One key reason is that cities, as they evolve, naturally spread out. As New York University’s Shlomo Angel has pointed out, virtually all major cities in the world are growing more outward than inward, and becoming less dense in the process. This is not only true in the United States, but also in Europe and, even more surprisingly developing countries as well. For example, over the past four decades, everyone’s favorite dense core city, Paris, has seen its urban land area expand 55%, while its population has risen only 21%. Today, the geographical extent of urban Paris is more than 25 times that of the ville de Paris, home to most of the familiar tourist attractions. In some ascendant countries, notably China, American-style suburbs are being duplicated; and when Chinese and other Asians immigrate, they tend to move to lower-density suburban areas. The only exceptions have been cities where development has been distorted by ideology, such as Moscow before the fall of the Soviet Union, notes Alain Bertaud, a former principal planner World Bank. The reason for moving outward may be lost on theorists and their real estate backers, but they remain compelling for many people, particularly families. A national association of realtors survey in 2011 found that roughly 8o% of adults prefer to live in detached single-family houses while only 8% preferred an apartment. It is thus not surprising that the suburbs, which abound in detached housing, contain nearly three-quarters of America’s major metropolitan population or that areas outside the urban core accounted for 99% of growth between 2000 and 2010. For the most part, this suggest the population, for the most part, will continue to seek out the periphery. This is not only true, as NYU’s Angel points out, in the United States or in similar countries such as Australia or Canada. As people seek out more affordable and larger housing, they tend to spread out from their historic cores. It happens most decisively in wealthy areas that are also land-rich. This is not to say that the higher-density enclaves of urban areas do not have an important place. In terms of culture, finance, media and certain other transaction-based industries, a number of dense urban cores remain unassailable in their efficiency and appeal. But in the United States, and much of the rest of the high-income world, this is accomplished by bringing residents from the periphery to the core — by car, train, bus and increasingly through telecommunications, even as most jobs are located elsewhere in the urban area. The future shape of the city is likely to continue expanding, even as some urban cores grow. Visit any burgeoning city in the developing world from Shanghai to Mexico City and the same reality emerges: as cities get larger, they spread out, as people begin to aspire, as best they can, for the quality of life that most North Americans and Europeans already take for granted. Dhaka photo by wiki commons user BL2593. Submitted by Scott Le Vine on Thu, 04/18/2013 - 07:30. Hmmm...what do Hartford CT & San Jose CA have in common? They're within striking distance of NYC & SF, that's what. They're not really stand-alone regions, this point's probably a statistical artefact. Submitted by PhilBest on Fri, 04/19/2013 - 03:37. I don't know about Hartford. Can someone tell us more about why it is high-income? It would seem crucial to the formation of this famous cluster, that at the time it formed, land use restrictions were minimal and land cost low. Studies into why the UK has no equivalent phenomenons, conclude that strict anti-growth urban planning and high land costs prevent it. Submitted by MarketAndChurch on Wed, 04/17/2013 - 01:12. "Where there is no vision, the people parish" is from the book of Proverbs, and the message is even more true today then ever. Bringing low-income people into a dense area who 1.) have no access to upward mobility, in terms of jobs, 2.) have settled for a mediocre existence, and are happy just to get by, and 3.) have so much of their lives already subsidized, from food stamps to rent control to government-backed student loans, means you are just collecting and centralizing the Democratic voter-base into one area, with no serious effort made to elevate their ability and desire to move up the economic ladder. Number 2 is okay, when you are in the middle class, but even then, a society who has lost its dynamism and purpose will not last many generations. An accepting of a mediocre existence is never simply "not doing anything." The "not-doing-anything" part is actually doing something, because we don't live on self-sustaining islands, but rather, are a part of a greater ecosystem, one that feeds us and we feed it. Therefore, what the "not-doing-anything" actually is... is sending a message to new blood, new ideas, and new businesses to stay away, and forgo our enclave or area, for a more dynamic, diverse, richer ecosystem. It doesn't work in middle-of-nowhere America, and it doesn't work in the poverty-entrapment that much of Urban America has become. And most importantly, number 2 will not work if it is accompanied by a culture of dependency, and a poor jobs environment, which is what LA mostly is. Densification only exasperates the issue. The wealthy and the poor do not coincide the same realities, as new condo's and increased rents force the poor to poorer parts of the city/metropolitan and never do these new condo developments actually make enough units for the lower-middle class to afford residency. These taxpayer subsidized densified projects, who actually offer the poor a meaningful allotment of units, only pool together all the people who have problems, and all their problems. The correct way forward is to focus 100% on what will allow the poor upward mobility: Jobs. Decent-paying Jobs. Not just looking to attract the next Google which is great for tax revenue for city hall, but does not meaningfully employ a large number of people. But rather, low-to-middle skill jobs, and invest in training programs at the community college level, that can build the worker base that high-skill companies are looking for. The poor can then choose where they want to live, be it urban areas, or the suburbs if they so choose. But the current reality cannot stay the same, wherein we pool them into one area that will only end up emulating projects-like conditions, or force them into the most undesirable part of town. Submitted by PhilBest on Wed, 04/17/2013 - 23:12. High density is the first state of the urban economy in the "developing world" city (including the 1st world 150 years ago). As time goes on and incomes rise and mobility rises, people "buy their way out of density". There are those who do not, and for them, density correlates with poverty. SOME urban economies end up developing in the direction of heavy reliance on sectors that generate high incomes with little space per worker; eg finance, media, advertising, law, accounting. These sectors tend to cluster at high density, and some proportion of their workforces will tend to locate their residences nearby. This usually involves "renewal" and "gentrification" and high rents. The dilemma is that the higher that city-centre economic rent goes, due to the presence of these high income sectors and their workforces, the more difficult it is to provide any acceptable housing at all for lower income workers. A feature of London and NYC and other such cities, is large numbers of recent migrants from 3rd world countries, living in grossly overcrowded conditions. The provision of heavily subsidised mass transit services, along with relaxed immigration policies, is a way that the high income urban sectors extract further "rent" from the economy as a whole. High income people and businesses at these high-income locations simply should be having to pay more to get cleaners and shelf re-stockers and dish-washers. They get away with not paying more, by the fact that immigrants are prepared to tolerate overcrowding, and workers get to catch subsidised trains from afar. "Blighted" inner city conditions usually persist the longest when there is a lack of renewal and gentrification, due to the fact that not every city is lucky enough to get a Wall Street, and also a lack of opportunities for local unskilled employment and a lack of opportunities for re-location to the suburbs where there is more employment opportunities. Gradually the blighted locations empty out of the people with sufficient social mobility, leaving a higher and higher proportion among those left, of "hopeless". So your last para is a very accurate statement of the necessary package of solutions. Submitted by MarketAndChurch on Sat, 04/20/2013 - 02:33. I understand why these dense places are dense and should remain dense. Tech, Finance, Marketing, and many of these types of businesses need this type of environment, to have a consolidated and centralized supply chain, within immediate access. I, by the way, have nothing against Gentrification, per se... so much as I cannot quite make out why the poorer, and less-abled people who live here in Portland have flocked south of Division on down to Clackamas/OregonCity, and/or east of 82nd, on out to Gresham. I know the price of rent rises when an area is in demand, and landlords are willing to raise prices to the new levels that newer occupants can afford, pricing current residents out of the market. And rent control only seems to distort the housing picture. But there's got to be some way we can gentrify, while allowing the poor residency in the same neighborhood, without resorting to rent control. What immigration model would resolve the issue of "rent" being extracted from the local economy? And wouldn't the absence of the alleviation that immigrant and low-wage workers provide, result in a hallowing out of start-up entrepreneurial ventures, that don't have the backing or buying prowess of Walmart, McDonalds, and Macy's? There are businesses who can afford to pay extra to their workers, but forcing a startup restaurant or startup businesses, who likely won't make a profit, let alone pay back their debt in those first crucial years, to pay employees what the market environment says they should. Should it be based on a company's profit? And how can we determine the apprfopriate median payrate for a dish washer in NYC? I am asking this out of curiosity, because I support a liberal immigration policy in the sense that I want those who want to come here, and share in the American dream, to be able to. But I fully acknowledge the problems that come with immigration.